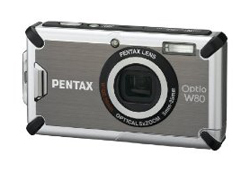 Photography Blog has reviewed the Pentax Optio W80 compact digital camera. The W80 feature a 12.1 megapixel sensor and weather resistant features like water proof down to 5 meters and freeze proof to -10°C. Photography Blog ends up giving the Pentax Optio W80 a “Recommended” 4 out 5 star rating. It scores high on features and design, but lower on image quality as the camera produces noise even at ISO 100 and no zoom while shooting video. Read the full review of the Pentax Optio W80 camera here.